A while ago I read a review of an Etsy shop on The Lilac Llinet. She had purchased a panda mystery bag from Hearts by Emma and it was just adorable! I mean, panda themed stationery! What’s not to love? I immediately made my way over there and decided to treat myself to a rainbow mystery bag, and it arrived in my mail box the other day. The goodies were wrapped in gorgeous flower petal paper – I should probably have taken a photo of it pre-unwrapping for this post, but honestly I’d forgotten I even placed the order so I tore right in to try and figure out what on Earth I had just received! I could see a cute rainbow/shooting star paper clip inside the pencil case, but not much else. Once the paper bag was out, it became apparent that there were pencils in there. And a pen. That’s all the items from the little paper bag. And there’s everything all together. The day I received my order was grey and rainy, so this rainbow goodie bag added a much-needed splash of colour to my morning. And those pens are AMAZING! Seriously… I don’t want to write with anything else now! I will definitely be purchasing from Hearts by Emma again. So, I made it to Switzerland! I actually managed to get all the cleaning done in time and the move itself went smoothly. It was a looong day though, hence no blog post last night. 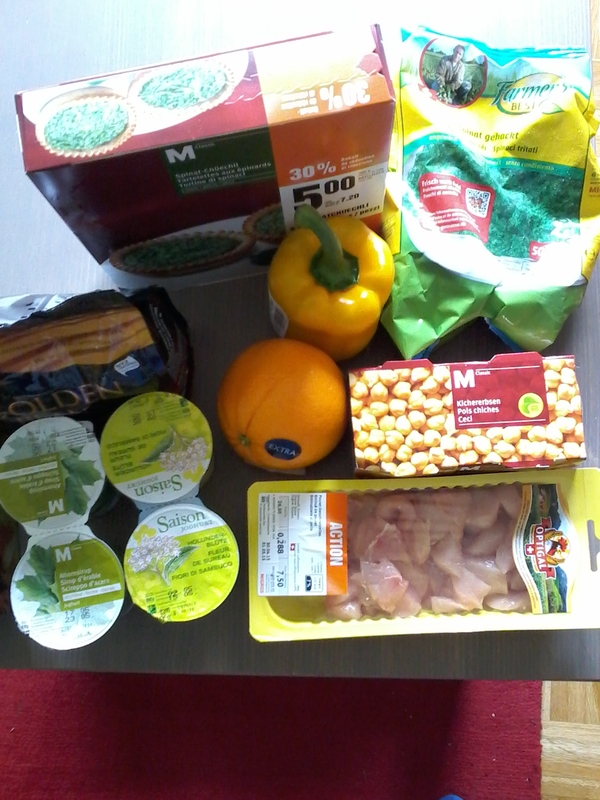 That little lot cost me 34 Swiss francs, which is 32 euros and 82 cents or 23 pounds 49p. I think it’s about time Jan got his first Swiss pay check! Did you all have a good weekend? Mine flew by too fast, as usual, but I managed to cram a lot in. On Saturday, I dragged the boyfriend shopping with me. After weeks of failure, I wanted to finally purchase a dress for the christening I’m going to in 2 weeks and I needed him along for a second opinion. We ended up in a shop called BiBa, which I’ve never been in before, and after trying on a dress that made me look completely shapeless, the shop assistant remembered something else they had in stock and came back with something else for me to try on. It fit, it emphasised my good bits (whilst hiding the worst of the lumps and bumps) and I liked the colours… even the little bit of pink on the front didn’t disturb me too much (I hate pink!). And – best of all – it was size XS (something I suspect had more to do with the shop’s sizing system than me). Jan liked it as well, so we decided to go with it, even though it cost slightly more than I had been planning to spend. That evening, we went to Karlsruhe’s beach bar. One of our friends couldn’t believe we’d never been, and insisted that we take the opportunity now the weather is finally nice. It could very well be raining again by this time next week, and there isn’t that much of the summer left any more. The place itself was nice enough… it’s on the roof of a multi-story carpark, which is pretty cool. You can watch the birds and, once it gets dark, see the stars. The service was incredibly slow though, and the cocktails I tried were a bit meh. The Mojito Razz (raspbery mojito made using Bacardi Razz) was nice enough, but the Hugo was far too sweet and Jan’s Sundowner was awful! Later, we moved on to a new place that Jan and I have walked past a couple of times and been meaning to check out. The Strawberry Colada I had there was amazing! Not too sweet and made with real strawberries. On Sunday evening, we were invited round to a friend’s place for dinner. We had peach chicken with couscous, which was delicious! This was followed by chocolate fondue with plenty of fruit for dipping. My waist line did not thank me, but it was so, so worth it! I also indulged in some Pimms and lemonade (now that’s what they Aldi should have had for their British Isles week instead of Buck’s Fizz… Pimms!). Good food, good company and wine… could there be a more perfect way to finish the weekend?